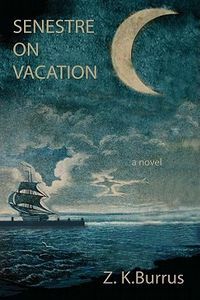 Senestre on Vacation by Z. K. Burrus, a Mysterious Review. Review: After police detective Thomas Senestre receives a mysterious letter from someone who claims to be a friend of his Mother asking for his help, he's suspicious … but he has some vacation time coming and doesn't see the harm in following up in Senestre on Vacation, the first mystery in this series by Z. K. Burrus. Flutter, flutter went the hands. "Oh, no, no. There'd be no reason for that. This is Pantego. We don't lock doors in Pantego." Certainly true of a considerable portion of Pantego residents. He'd seen evidence of that on his rambles. But the Amazon's lips had parted. Either she should contradict or he should. Town precedent nothwithstanding, Adora did, on occasion, lock her door. He'd been on the other side of her locked door. Adora was lying about her locked door policy. "You suspect you're being stalked, but leave your apartment unlocked. Interesting," he said. "Stop badgering her! Can't you see she's upset?" He could see that the Amazon was upset. That he could see. And not only with him. And this style is probably the most significant factor in determining if readers will be taken with Senestre and his investigation … and return for a second visit, should a sequel be written. Acknowledgment: Livingston Press provided a trade paperback edition of Senestre on Vacation for this review.